The Minister of Women Affairs, Gender and Community Development Cde Oppah Muchinguri yesterday collapsed at Nyava Growth Point in the Musana area in Bindura district while delivering a speech at the launch of the Rural Women Assembly. 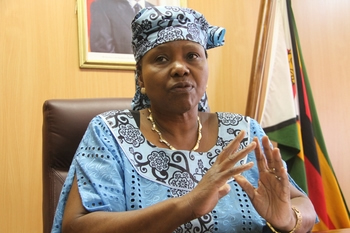 Minister Muchinguri is said to be diabetic. People with diabetes can sometimes lose consciousness if their blood sugar levels are too high or too low. Minister Muchinguri had spent the morning at Muunganirwa Garden where she launched the Quick Win Seed Input Scheme before travelling to Nyava Growth Point in the afternoon. Her deputy, Cde Abigail Damasane, quickly moved in to calm down the gathering as Minister Muchinguri was being attended to by her aide and other invited guests. Hundreds of women who had gathered for the historic event clapped and ululated as she got up and dusted herself. In her remarks read by Cde Damasane, Cde Muchinguri applauded the Zimbabwe Farmers’ Union for successfully launching the Rural Women Assembly event. “This shows the world that women are organised and can participate at regional and international fora to fight for their cause. This is in line with my ministry’s mandate of spearheading the empowerment of women at all levels. I am glad that the Rural Women’s Assembly will work with my ministry to address the issues raised by women in agriculture,” she said. Minister Muchinguri also highlighted the need for rural women to mobilise themselves and advocate for their needs and build a critical mass to influence the policy environment, and to support the advocacy of those whose rights are infringed upon.